The Nakamichi My Mini Plus was released in 2012 actually, and I received this as a door gift at a recent conference I attended. For a free gift, it turned out pretty nice. It’s a portable cube speaker that’s rather capable at doling out good quality sound in a small package. I saw it on sale too at one of those Christmas gift fairs, where it was retailing at around the $20-$30 region, which is comparable to other no-brand speakers of this range. I thought this might be of better consideration instead, considering the sound quality and playback capability. There is a newer revision with Bluetooth which is awesome to have for easy wireless pairing with mobile phones. Audio quality turned out pretty good. I put it up against the XMI X-Mini Capsule speaker since both are rather comparable. The X-Mini is slightly smaller and has a better design in both looks and functionality with the built-in cable cord. More importantly, in terms of sound, the Nakamichi fared much better than the X-Mini. 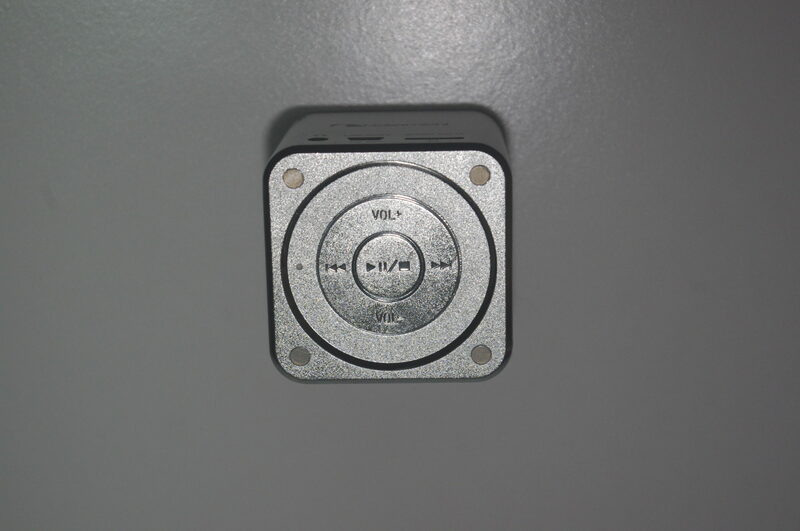 It handled low frequencies well, and offered good audio separation of the different frequencies. In a head to head comparison, the XMI crackled at both high volumes and high frequencies which was disappointing. This is a competitive sector, with many other no-brand speakers in this space that it is an ardous task to get yourself recognised in the crowded market. Played a range of music (thanks Google Play Music!) and felt the speaker handled itself decently. It was good enough for playback in a room or even to accompany me when I am out washing my car thanks to its portable nature. Too bad that it’s only mono or there’s no way to pair it up with another speaker for stereo playback like Sonos. 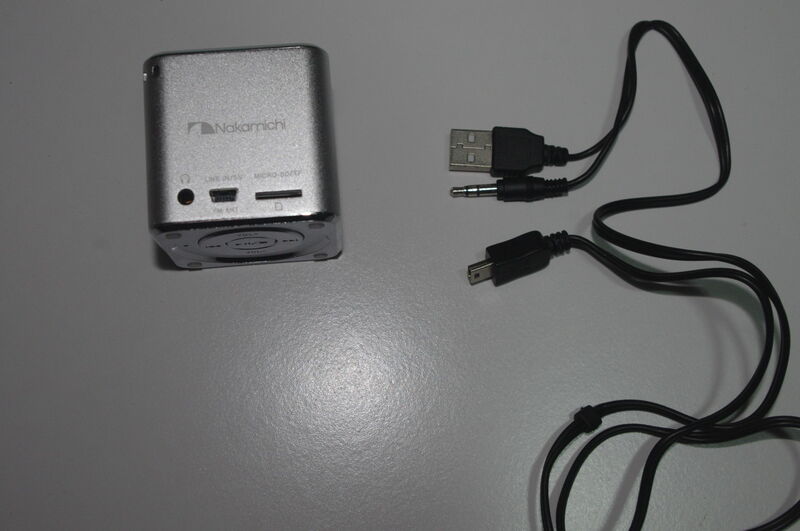 The Nakamichi Mini Speaker has an integrated FM tuner although you need to attach the mini USB cable so that it can function as an antenna. 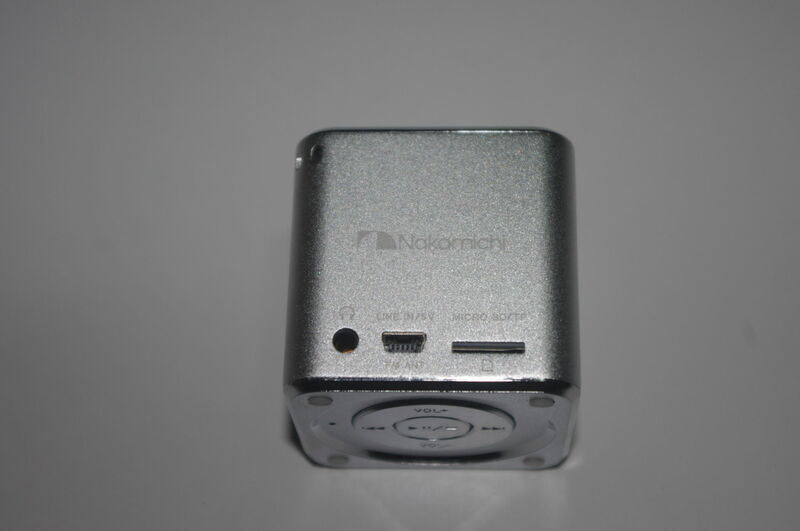 There’s also a MicroSD slot such that the Nakamichi can work as a standalone jukebox. The interface is atrocious though. If you have many songs and folders on your SD card, there’s no easy way to switch between tracks or albums. There’s also no shuffle function, in case you were wondering. Anyway, MP3s are fast becoming extinct. Now’s the time for streaming music, and that’s where the new version with Bluetooth would come in handy. In time to come, I guess the next step would be to integrate with Spotify or Google Play Music so that you can have a portable jukebox. Something like a standalone Chromecast (for audio). If you are looking for the best bluetooth portable speaker, the linked article from Wirecutter would come in handy. Back to the interface, there’s no clear indication of which mode you are in on the Nakamichi mini speaker – audio in, microSD, or FM tuner. You switch between modes by pressing and holding the central play button, and cycle through the various options until you figure out which mode you are in. Next problem, getting to a station, so you just keep pressing up / down to tune until you come across your desired station. Not exactly ideal. The FM reception is average at best, and in an indoor environment, there’s significant static when no such problems listening to the FM radio on my phone instead. The other point of irritation. It uses a proprietary mini USB to USB / 3.5mm extension jack. I initially connected a 3.5mm to 3.5mm cable from my phone to the speaker thinking it would play but only to realise it was an audio in jack. I guess, if u wanted to listen to your microSD tunes via earphones. I don’t like proprietary stuff. If I lose the original, I would have a hard time replacing it. I can’t use my other 3.5mm cables around the house too. The X-Mini capsule is more portable in that it accepts 3.5mm input and also has a built in cable that is neatly tucked away when not i nuse. I like the sound, so at least this speaker got its primary function right. Audio quality is far and away the most important aspect of any speaker. The flaws are really on the other features which I take more as dressing up and I can live with them, but they could be dealbreakers depending on how you intend to use this speaker.